Doug Ford warned in his inaugural speech as Ontario’s Premier that his province is a troubled land of crumbling infrastructure, broken hospitals and fiscal mismanagement, where children head elsewhere to find good jobs and the privileged few have enriched themselves at the expense of most. 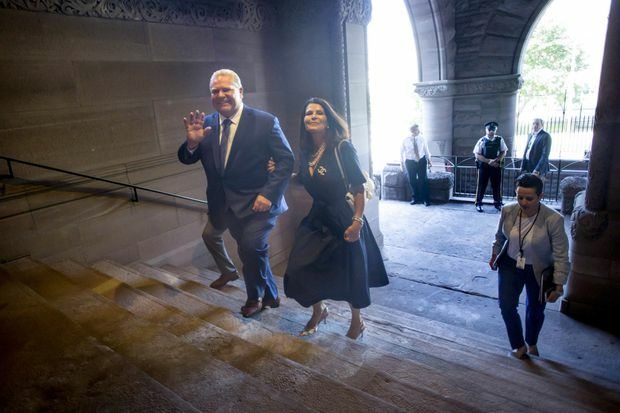 Speaking from the front steps of Queen’s Park after he was sworn in as Ontario’s 26th premier on Friday morning, Mr. Ford pledged to return the province to prosperity by cutting taxes, curtailing government spending and protecting jobs in manufacturing. Over the past four months, the 53-year-old former Toronto councillor took over Ontario’s Progressive Conservatives and led them to government with a populist message that often took aim at the province’s elites in politics and business. Mr. Ford’s swearing-in ends 15 years of Liberal rule in Ontario and signals a major shift that could lead to skirmishes with the federal government over carbon pricing. “Our province is at a critical juncture. We must not underestimate the gravity of this situation we face,” Mr. Ford said under a blazing sun. Mr. Ford named 20 members to his first cabinet on Friday, promoting his two main rivals for the Tory leadership earlier this year to senior positions. Christine Elliott, who was Ontario’s first Patient Ombudsman under Liberal premier Kathleen Wynne, is his Deputy Premier and Minister of Health. Caroline Mulroney, who has a law degree from New York University and a degree in government from Harvard, was named Attorney-General and minister responsible for francophone affairs. Mr. Ford promised he will restore his province to its “rightful place” as Canada’s economic engine. However, Ontario’s economy has been growing swiftly and the unemployment rate, at 5.7 per cent, is the healthiest in nearly a generation. Much of that growth has gone to the Toronto region and Mr. Ford has focused his attention on the plight of manufacturing, which has lost more than 300,000 jobs over the past decade. Trade worries during the renegotiation of the North American free-trade agreement (NAFTA) and U.S. President Donald Trump’s threat to levy a tariff on Canadian-made vehicles could send Ontario’s manufacturing sector into a tailspin. After campaigning on a promise to bring back manufacturing jobs, Mr. Ford has said he will work with Prime Minister Justin Trudeau regarding the NAFTA talks. The new Tory-led legislature will meet for a short summer session starting the week of July 9. Mr. Ford said his first priority is scrapping Ontario’s cap-and-trade system aimed at reducing carbon emissions. He has said he will join with Saskatchewan’s conservative Premier and battle Mr. Trudeau in the courts to stop a federal law requiring all provinces to have some form of carbon pricing in place by Jan. 1, 2019. Ontario’s new Finance Minister, Vic Fedeli, applauded the move to dismantle cap-and-trade. Mr. Fedeli will play a key role in Mr. Ford’s government, tasked with slashing taxes on incomes, businesses and gasoline while returning Ontario to a budget surplus within four years. The Tories have also said they will find $6-billion in efficiencies without cutting any government jobs. “The first thing we need to do is open the books and the first thing Premier Ford did was announce the end of the cap-and-trade tax in Ontario; I think that’s a fabulous start. Hang on for the ride, I think it’s going to be a great time,” Mr. Fedeli told reporters. Mr. Fedeli is a former mayor of North Bay and was the PC Party’s interim chief after Patrick Brown resigned as leader in January amid allegations of sexual misconduct. Mr. Ford’s cabinet is leaner than Ms. Wynne’s final executive council, which had 28 ministers, including the premier herself. The province’s new Official Opposition, the New Democratic Party, attacked Mr. Ford on Friday over the lack of diversity in his cabinet − Minister of Seniors and Accessibility Raymond Cho is the only visible minority. The new cabinet reflects Mr. Ford’s priorities, while also showing which of the outgoing Liberal commitments he does not intend to continue. Missing from the cabinet table will be titles including the words climate change, immigration, anti-racism, research, innovation or science. Newly elected New Democrat Sara Singh said the predominantly male, white cabinet doesn’t reflect Ontario’s diversity. She said she was also troubled by the Premier’s decision to not have a stand-alone minister of Indigenous affairs. Former federal MP Greg Rickford will hold that portfolio while also being the Minister of Energy, Northern Development and Mines. “A part-time minister is not good enough. … Mr. Ford’s announcements today do not signal his intention to clean up the mess the Liberal legacy has left us. It doesn’t make progress for Indigenous communities, hardworking families, women or people of colour,” Ms. Singh said. Ontario Regional Chief RoseAnne Archibald, who represents 133 First Nations, said Mr. Rickford has a deep understanding of First Nations issues, but she expressed disappointment over the decision to leave “reconciliation” out of his title. “The most difficult thing is that it is no longer called the minister of Indigenous relations and reconciliation; they’ve gone back to simply the Minister of Indigenous Affairs. That, to me, is problematic. We need reconciliation,” she said. Peter Bethlenfalvy, President of the Treasury Board.